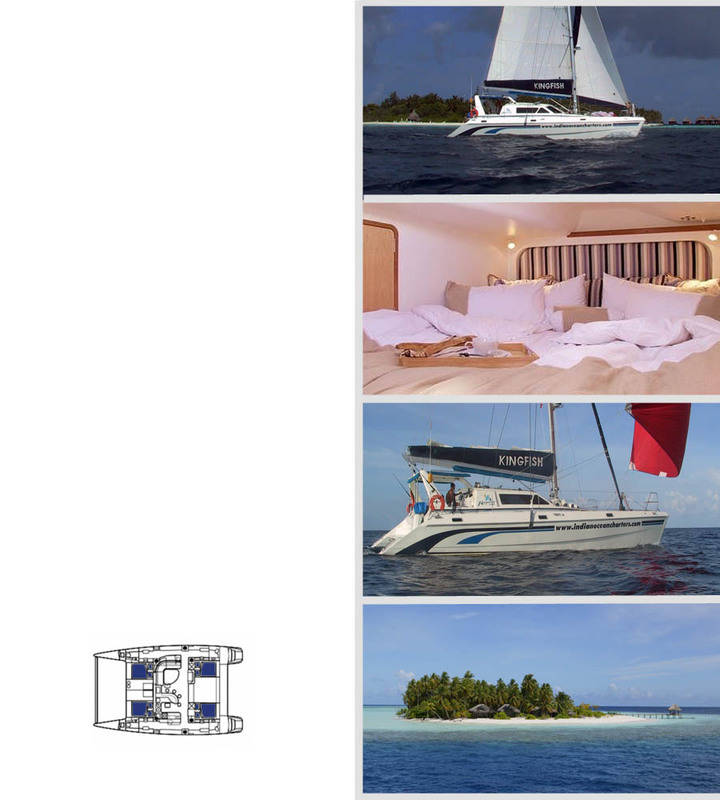 Mayotte 47: This luxury Catamaran, sleeps 4-8 Guests. Four spacious double cabins with en suite bathrooms will be your home away from home. Interior: Four cabins that sleep eight in addition to the crew. Exterior: The catamaran is an ocean going yacht ideal for comfortable island hopping. Galley: The cook will prepare exquisite local or international meals. Deck: The deck provides plenty of sunbathing space. Cabins: All cabins have en suite bathrooms. Crew berths area separated in the bows. Itineraries depend on the preferences of the guests, time available and the weather. Furthermore, in an area with 1200 islands and thousands of protective reefs, we are very flexible when it comes to finding safe anchorages and are not necessarily bound to preset itineraries. When agreeable to our clients, we sometimes travel between atolls at night(they can be between 5 and 50 miles apart), to maximize the day activities. Any itinerary starts when we pick you up at the airport island. As we have a permit to dock at the airport, it only takes about 100 meters to get from customs to the yacht! 5-8 day charter: Combination of North and South Male Atoll and Ari Atoll, which requires a crossing of 30 miles. 8+ day charters : You decide: 1200 islands, with thousands of reefs and anchorages to choose from! Inshore sailing: Diving, snorkeling, beach, island hopping, fishing. Nosy Be area (2-3 days): Relaxed flat water sailing with quiet anchorages and great spots for snorkeling and island exploration. Mitsio Islands (3-7days): About 30 miles North East of Nosy Be, about 15 different islands form part of this group. Excellent beaches and diving, secluded anchorages. This trip can be extended to Cap St. Sebastien or further for another 3-4 days. Recommended period for this area is November-January, when the this normally windy area becomes mild. Radama Islands (4-14 days): Situated about 45 miles South West of Nosy Be, this group consist of 6 islands, with plenty more small drying sandbanks and secluded bays on the way. One also passes Nosy Iranja (Turtle Island) and rivers that can be explored by kayak or dinghy. For die-hard fishermen we enlist the services of some of the local fishing experts, who will use his own deep-sea boat to visit the outer bank on a daily basis, while our cats function as a moving hotel, allowing our clients to fish along the whole coast line, rather than in a limited area (check for availability and rates).